When I was in high school, every Friday afternoon I’d catch the bus to my grandparents’ house for a few hours. As someone who constantly needs to be doing something, I found myself bored nearly every visit. Their entire book collection was in Italian, their TV was typically tuned into some sitcom about people living on the same street, and they didn’t even have painfully slow dial-up for me to check on my Neopets. So, I’d entertain myself by thumbing through an outdated copy of the Yellow Pages. Now, you’re probably thinking, “Okay Steph, you’re a weirdo. Just get to the bloody hashtag research process already so I can get ALL of the new followers.” Bear with me here – I promise this story has a point. I want you to think of Instagram hashtags as the Yellow Pages. There are people scrolling through certain hashtags just to see what they can find, which means that hashtags are an excellent way for new people to find you. But, let this be a reminder to only use relevant hashtags. You wouldn’t expect to see a handyman listed in the “Dentists” section of the Yellow Pages, and hashtags are no different. If you’re looking for a blog post that’s going to give you the “right” hashtags on a silver platter, this isn’t it. Instead, I’m going to share with you the exact hashtag research process I use to find the right hashtags for your business, so you can reach more of the right people – that is, people who actually might one day buy from you or work with you. After all, there’s no point advertising in the Sydney Yellow Pages when you can only work with people in Melbourne. 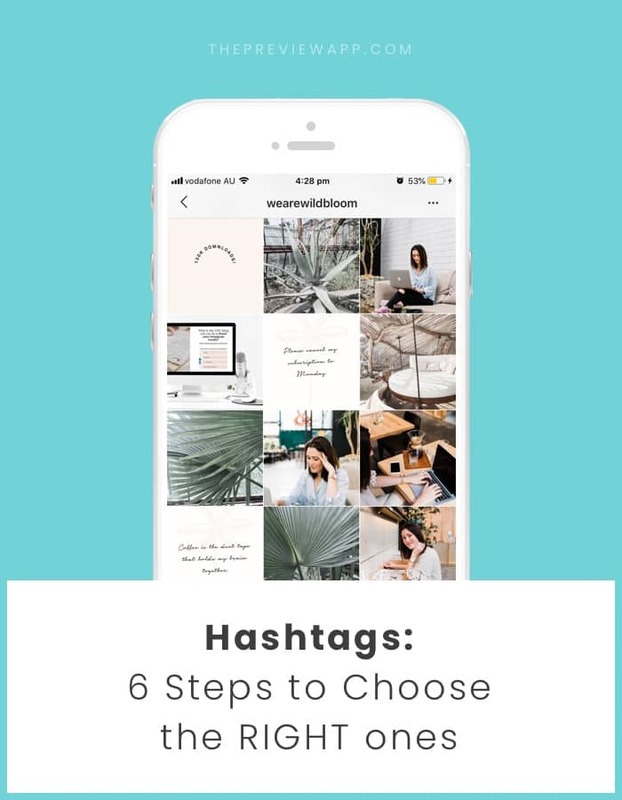 I’ve put together a free Instagram hashtag cheat sheet and worksheet you can use to work through this process alongside this blog post. Download it here. If you haven’t changed up your hashtags since #nomakeupselfie was a thing, then it’s time to give them a refresh. 1. Are any of your hashtags too broad (>1 million posts)? It might sound good in theory, to post on the most popular hashtags, but is your ideal customer or client really browsing #followforfollow? Probably not. 2. Are any of your hashtags too narrow (<1,000 posts)? Unless you’re in a super niche space, a hashtag this narrow won’t usually reach enough people. 3. Did any of your past posts have a higher-than-usual discovery by hashtags? If so, you definitely want to save these hashtags for future use. If you’re not sure what I’m on about here, I suggest you read up on understanding Instagram analytics. You don’t always post about the exact same thing on Instagram, do you? So why would you use the same hashtags for every single Instagram post? In this step, I want you to go back and look at your past 15-20 posts and list out the 3-5 core topics you post about. These are going to be your different hashtag categories, or “hashtag sets”. In the Instagram Hashtag Cheat Sheet and Worksheet, I’ve created a section for you to map out your different hashtag sets – so fill it out. Not sure what to post about on Instagram? Now would be a great time to revisit your content strategy. This is the fun part. It’s time to stalk your competitors or similar businesses in your space. Look at what hashtags they’ve used for their posts and add any new ones to your hashtag sets. Note: If a particular hashtag is relevant for more than one set, you can include it in both sets or just one – it’s up to you. Then, make use of Preview App’s hashtag tools, like the Hashtag Finder and Hashtag Communities to start filling out each hashtag set. Repeat this process until you have a couple of hashtags in each set. Open up the Instagram app and type in a hashtag. Any hashtag. Look at the top posts that this brings up, and see what hashtags they’re using. Keep clicking into different hashtags and you’ll be amazed at what you find! Rinse and repeat this process until you have 25-30 hashtags in each set. Preview App allows you to save different sets using the Hashtag Groups feature – so take advantage of it! This makes it super easy to keep your hashtags organised and upload them into Instagram with each post. After a few weeks of posting with your new hashtags, go back and review how they’re performing. Are there any that are getting better than usual engagement? Or worse? Preview App’s Instagram Hashtag Tester tool is a great way to measure and track these results. Remember to download my free Instagram Hashtags Cheat Sheet and Worksheet to work through.